This card was so much fun to make. I just love the citrus colors and made this card with all those bright colors. It so reminds me of summer and I guess with all the dark days and cold weather summer seems like a beautiful dream. UPDATE : This card won the Everybody Art Challenge #134. Make sure to check out the blog candy giveaway in the post below. 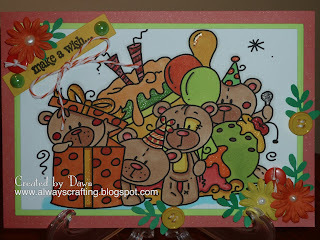 This cute birthday bears image is from Bugaboo Stamps. You can get this freebie stamp here. Very cute card, the digi is adorable and I love the bright colours! Thank you for playing along with us at Creative Card Crew! This is so cute, love the colour combo and those sweet teddies. Thank you for joining us at Fairy Fun Friday this week. OM Gosh this is adorable!! I absolutely love the way you've colored this image! Thanks for Cooking it up with Katie this week! Wow!! This is an adorable card - what a fab image! You have placed the buttons and flowers in just thee right places!! Thanks for joining us over at Pear Tree Designs in our 'Birthday' challenge - good luck. Your scene is so cute and looks like fun! Thanks for joining us at ABC! Thanks for play with us at Birthday Sundaes! What a fun and festive card! Super cute!! Thanks for joining us this week at The Shabby Tea Room. Wow what a fun party card. Thanks for joining us at ABC DT Challenge and be sure to add our blinkie to your side bar for a chance to win even more. Good Luck. A beautiful card, lovely and zingy. Very cute image.